Alterations have been carried out at a Cramlington roundabout which has been the scene of several collisions. The work has been undertaken at the A1068/A1172 ‘Aerodrome Roundabout’, which has seen 11 personal injury collisions over the past four years, six of them involving cyclists. Many of these collisions have happened on the roundabout itself as a result of vehicles failing to give way. The main area of concern was vehicles entering the roundabout when travelling south from Bedlington to Cramlington. The scheme has involved the introduction of a 50mph speed limit on the southbound approach. At the roundabout the road has been narrowed to a single lane on the north and west side, aiming to improve lane discipline which has been a factor in a number of the collisions. The give way line has also been moved further back, to prevent vehicles from overshooting. Warning signs have been improved at the nearby crossing points to and from Northumberlandia. 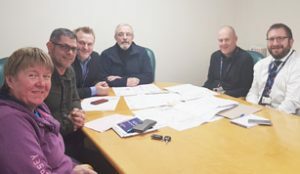 However the changes have resulted in some complaints and to address this Cramlington town councillors have met traffic engineers from the County Council to discuss their concerns. Councillors expressed concerns that the signage approaching the new layout was not in place and that further consideration must be given to the safety of cyclists. It was agreed these would be looked into as a matter of urgency. Councillor Wayne Daley also asked that the temporary 40mph speed limits on approaches to the roundabout be made permanent. County engineers advised that with this type of scheme some initial problems were not unusual but accepted that the implementation of the scheme could have been better. They agreed to respond to issues raised by local councillors and to monitor the effects of the new layout over the coming months. Similar schemes have been introduced recently at North Seaton and Woodhorn Roundabouts near Ashington and have had a significant improvement on road safety. Glen Sanderson, Cabinet Member for Environment and Local Services with Northumberland County Council, said: “We need to ensure our road network is safe for all users and this scheme has involved a number of improvements.